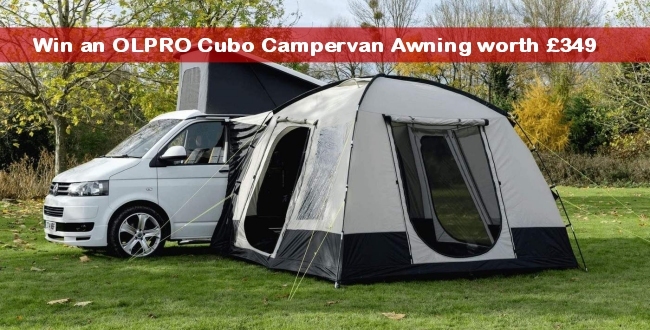 The Cubo is a simple, easy to pitch Driveaway campervan awning from OLPRO. This geodesic design uses just two fibreglass poles to create extra living or storage space for your campervan. It has an RRP of £189 and can bought here (don't forget to use our 10% discount code below!) Stock is due in February 2018, and you can ensure you don't miss out by preordering now - pay a deposit of just £50 to secure your awning. The OLPRO Cubo will fit all camper vans between a height of 190cm and 240cm. The best way to attach the awning is by threading the beading on the tunnel into the awning rail or the guttering using the figure of eight attachment. If your camper van does not have either of these, there are straps included which go over the top of the vehicle, either side of a pop-up roof if you have one, and peg down the other side. To find out more and to enter the competition, click here	- competition now closed!